Barrett Simon, Leon, Kan.; Lauren Prill, Wichita, Kan.; and Savannah Speckhart, Princeville, Ill.
Each year since the first scholarships were awarded in 2012, Henry C. Gardiner scholarship applicants represent the best and brightest animal science and industry undergraduates enrolled at Kansas State University. The program creates a competitive environment for qualified students to vie for elite undergraduate scholarships. In addition to the applications, students must complete a rigorous interview conducted by a panel of K-State faculty and industry leaders. Academic standing, community service, work ethic and future goals are taken into consideration. Henry C. Gardiner Scholarship recipients for the 2016-2017 school year are Lauren Prill, Wichita, Kan.; Cami Roth, Sterling, Kan.; Barrett Simon, Leon, Kan.; and Savannah Speckhart, Princeville, Ill.
Lauren Prill transferred to K-State from Black Hawk College where she was a member of the livestock judging team. Lauren has served on the board of the Kansas Junior Hereford Association and attended the National Youth Leadership Conference as a member of the Junior Maine-Anjou Association. Prill interned in one of the largest county extension offices through the University of Nebraska, Holdrege. Plans for the future include working in the animal welfare sector and being an effective industry voice. Cami Roth has added to her work experience through internships with large commercial ranching operations, as well as managing a small herd she began building at a very early age. Roth has traveled to South America to broaden her industry experience. Cami plans to return to the family ranching operation and partner with her brother to become the fifth generation of Roth beef producers. Barrett Simon transferred to K-State from Butler Community College. Simon has gained valuable beef experience as a member of the K-State livestock judging team and through his participation in youth leadership endeavors. Simon has broadened his perspective through attendance at Beef Improvement Federation annual meetings. After graduation, Barrett plans to return to the family beef operation and earn a position as the next generation decision maker. Savannah Speckhart also transferred to K-State from Black Hawk College, graduating at the top of her class. Speckhart has gained experience through internships at Westwood Embryo Services, Waverly, Iowa, and is certified in bovine artificial insemination. As an undergraduate researcher, she is currently assisting in research related to black-hided feedlot steers. Savannah's near-term plans are to complete undergraduate requirements and pursue a post-graduate degree. "It is incredibly rewarding for the Gardiner family to be a part of this process," said Mark Gardiner. "From the students competing for the first scholarships in 2012 through the most recent applicants, the caliber of intellect, integrity and ambition is beyond any expectation. The future of the beef industry is bright if we can continue to provide a pathway for these young people to achieve success in the livestock industry." Students classified as a rising-junior, junior or senior, either enrolled in or planning to enroll at Kansas State University with a major in animal science & industry or closely related field may apply. 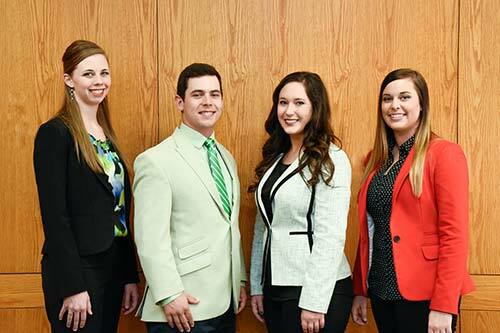 Henry C. Gardiner Scholarships are awarded annually to K-State students meeting rigorous criteria and exhibiting a passion to improve the beef industry. The Henry C. Gardiner Scholarship is possible through the generous contributions of Gardiner customers, friends and family in an effort to continue the legacy of Henry Gardiner. To date, 14 undergraduate students have received $60,000 in scholarships. Henry instilled in his family the willingness, ambition and discipline to achieve goals. He challenged the beef industry to use science to develop tools which made rapid genetic improvements possible. Henry Gardiner readily incorporated technology and embraced change into his own business and was always willing to educate others about how they could do the same things to improve profitability. His vision and leadership positioned Gardiner Angus Ranch (GAR) as a world leader in providing beef cattle genetics and shaping the beef industry today and in the future. GAR is a family owned and operated business that produces registered and commercial Angus cattle. The original ranch was homesteaded near Ashland, Kan., in 1885 by Henry Gardiner's grandfather. Today, the ranch encompasses more than 46,000 acres. The Gardiner operation sells approximately 2,550 bulls and 2,000 registered and commercial females a year. GAR is a founding member of U.S. Premium Beef, the producer-owned limited liability corporation with minority ownership in National Beef, the nation's fourth largest beef processing company. By providing access to a proven value added processing system through GAR delivery rights, customers have received more than $6.61 million in premiums and dividends.